Acuerdos is an exciting new manual of supplementary activities designed for students in Business Spanish courses. Flexible enough to be used with any Business Spanish text, Acuerdos offers students 60 paired activities in which student A interfaces with student B, replicating the situations they will encounter in conducting business in Spanish. The activities in Acuerdos are designed to reflect natural communication processes utilized in standard business interactions. These activities encourage students to think critically, make decisions, negotiate, find solutions and exchange information with their partners, and in this way recreate an authentic use of language. 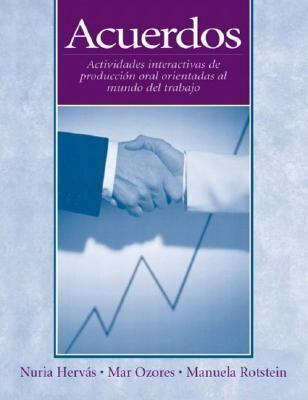 The activities primarily practice oral communication skills in business contexts and are sequenced from the most basic to the more complex.Hervás , Nuria is the author of 'Acuerdos Actividades Interactivas De Produccion Oral Orientadas Al Mundo Del Trabajo' with ISBN 9780131838208 and ISBN 0131838202. Loading marketplace prices 4 copies from $23.70 How does the rental process work?